Carlos Santana Takes A Classic Song To The Next Level! Carlos Santana, if you’re not aware, is one of the greatest gifts to music we have, even today. His soulful guitar playing and mesmerizing songwriting are often imitated, yet never duplicated. Ever since his big break on the Woodstock scene, he has become one of the most beloved and revered guitarists ever to grace to music scene. Relatively recently, he blessed us with his cover “While My Guitar Gently Weeps”, and brother… it is simply beautiful. 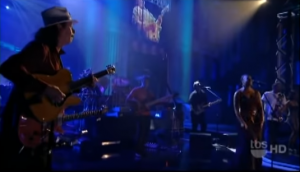 What you’re about to watch is Carlos Santana take to the stage of the ‘Lopez Tonight’ show and perform said song “While My Guitar Gently Weeps”. The crowd is understandably excited to see Carlos Santana, but what they are not prepared for is just how beautiful his cover of the song is. The crowd is simply stunned in every single way. See for yourself! This is undoubtedly George Harrison’s greatest contribution to The Beatles and music in general. And it’s been widely recognized as one of the finest pieces ever created. And so it comes as no surprise that several musicians tried to cover it. We have some of our favorites but Santana’s version is hard not to love. The singer deserves a lot of praise too because she brought something new and fresh to the table. It may not be the best cover version there is but it’s certainly sweet and relaxing. Santana knows how to make his guitar sing. be much more helpful than ever before. Its such as you read my thoughts! You seem to know so much approximately this, such as you wrote the book in it or something. Thanks for another fantastic post. The place else may just anyone get tat type of info in such an ideal manner of writing? at the look ffor such information. ownn weblog and was curious what all is needed to gget set up? Hey, I think your blog might bee having browser compatibility issues. it haas some overlapping. I just wanted to give you a quick heads up! What’s up, the whole thing iis going sound here and ofcourse every one is sharing facts, that’s actually excellent, keep up writing.